BEACHFRONT- Pool- Hot Tub- Private Beach Path on the best street on the island!! This is a Beautiful ABSOLUTE OCEANFRONT home with PRIVATE POOL. Great views from most of the rooms. Walk right out the back door and hit the sand! Large open living room, kitchen and dining area with wonderful ocean views. Granite counter tops hardwood floors and tile throughout. Downstairs: Living Room with flat screen TV, Blue Ray DVD and wet bar, Dining area off of Gourmet kitchen, Kitchen has stainless Steele Appliances. Large laundry room, Screened porch, Large master suite with King bed overlooking the ocean, has large bath with Jacuzzi tub and rain shower, flat screen TV, and deck. 1/2 bath off of hall. Large deck great for sunning. Custom built porch swings on main deck and on second guest level. Privacy trellis/lattice off Master Bedroom Suite. Upstairs: King bedroom with private bath, flat screen TV & DVD , ocean views and deck, Bunk room with 2 sets of bunks and trundle beds and private bath and TV. Queen bedroom with ocean views flat screen TV and deck, shares bath with 2nd queen bedroom. PRIVATE POOL, Boardwalk to the beach, Large deck overlooking beach with outdoor bar , beautifully landscaped yard. Gas Grill, large garage. Book now before the remaining weeks get gone, new to the rental program so there are prime weeks open! Roof top Crows Nest with amazing beach, ocean and Charleston Harbor views. Built in seating and table--have your meals or beverages on top of the world ! Internet, Cable TV, Flat Screen TV's in great Room, and all bedrooms. Elevator on request only or for disabled use only. Maximum 12 People, Maximum 5 cars, Pre- Approved pets with deposit, No smoking. Keywords: Beautiful Oceanfront home with private pool! Great views of beach and ocean! Our family enjoy a wonderful Thanksgiving week in this beautiful home. The outdoor space is simply beautiful. The kitchen is fully stocked and more than met our needs for preparing our Thanksgiving dinner. A great home for a family to gather and enjoy the beach and each other. We will be back! We enjoy the home and local fare. This is a great house with several areas to escape to or gather on the deck watching the ocean. Would definitely come back! The house was great. We had a wonderful time in the pool and hot tub. The ocean was close enough that it was easy to take the grandkids out with all their sand toys. Fabulous beach house close to Charleston!!! We enjoyed a wonderful extended weekend at this incredible beach house! 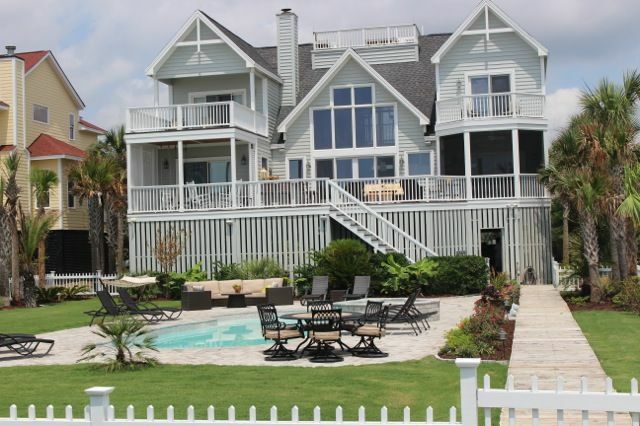 Roughly 30 minutes outside of Charleston, this property is located in a quiet strip along the Isle of Palms seashore. The pool and hot tub really sealed the deal with the family, and we also enjoyed walking down the beach to local restaurants for lunch. It really felt like a home rather than a lightly-equipped rental property. We really could have moved in for the summer! This house was very nice. It was exactly as it appears in the pictures, and was just what our family expected. Everyone enjoyed their stay, and we love vacationing in this area each year. The only strange thing was that while we were there, we were asked to meet with an insurance agent to walk through the home to take pictures one day, and had to schedule a time to do so. Another morning we arrived back to the house from breakfast and found the pool man working in the hot tub - with no warning to us that he would be at the home. Honestly we felt that those things should be scheduled while guests were not occupying the home, or at least scheduled and handled by the manager rather than the house guests. The beach access was fine if you're young and able to climb, but a little difficult for some of the folks in our group because it was a pretty steep slope. There wasn't anything to really grab onto getting back up the sand. Just take note if you have anyone elderly in your group! The pool was nice and well maintained - that's where we spent most of our time! We all enjoyed eating on the screened in dining area, and the kitchen was well equipped for cooking. Plenty of room for everyone. Overall, it was a great stay and we had fun! Glad you enjoyed your stay. Pool service is provided on Weds and Saturdays. During "Peak Season" The house is fully booked. There are no vacant days to provide upkeep when guests are not there. You were the first guest to arrive after a storm washed away the beach steps- (Act of God) they have been replaced with a new set ! Oceanfront beach house on Ocean Blvd.-- in the best location on the beach. Bike ride or walk to restaurants, clubs and other attractions. Great house with private path to ocean. Golf: Wild Dunes- one of the nicest courses in the area is on the island. Owner will hold reservation for 72 hours until deposit check is received. Rates subject to change.